[L] Thundershock: 20 damage. Flip a coin. If heads, the Defending Pokemon is now Paralyzed. [L][L][C] Reflect Energy: 50 damage. 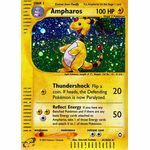 If you have any Benched Pokemon and if there are any basic Energy cards attached to Ampharos, take 1 of those Energy cards and attach it to 1 of those Pokemon. Poke-Body: Extreme Speed. You pay [C] less to retreat Arcanine for each Energy attached to it. [C][C][C] Fire Blow: 30+ damage. 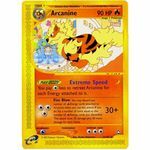 You may discard any number of [R] Energy cards attached to Arcanine when you use this attack. 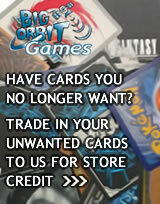 If you do, flip a number of coins equal to the number of [R] Energy cards you discarded. This attack does 30 damage plus 30 more damage for each heads. Poke-BODY: Extreme Speed: You pay Colourless less to retreat Arcanine for each Energy attached to it. [C][C][C] Fire Blow: 30+ damage. You may discard any number of Fire Energy cards attached to Arcanine when you use this attack. 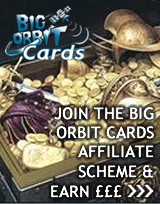 If you do, flip a number of coins equal to the number of Fire Energy cards you discarded. This attack does 30 damage plus 30 more damage for each heads. Poke-BODY: Gluey Slime: As long as Ariados is in play, each player must pay an additional Colourless to retreat his or her Active Pokemon. 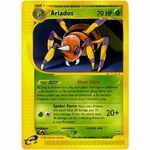 Gluey Slime can't make a player pay more than an additional Colourless to retreat a Pokemon, even if there is more than 1 Ariados in play. [G][C] Spider Force: 20+ damage. Flip a coin. If heads, this attack does 20 damage plus 10 more damage. If tails, this attack does 20 damage and the Defending Pokemon is now Paralyzed. 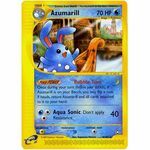 Poke-POWER: Bubble Turn: Once during your turn (before your attack), if Azumarill is on your Bench, you may flip a coin. If heads, return Azumarill and all cards attached to it to your hand. [W][C][C] Aqua Sonic: 40 damage. Don't apply Resistance.